First of all, this is a bit too similar to Mairsil, the Pretender . Secondly, you cannot own other people's cards. That is why cards like Demonic Attorney are banned in everything. Secondly, I like the bit of lore that you added and it will be nice to incorportorate. The entropomancer class sounds really broken in terms of abilities. When ~ enters the battlefield, create a Legendary artifact token named Sphere of Annihilation with ":Exile target creature." and ", sacrifice ~: Put a creature exiled with ~ under your control." This should keep the flavor, while toning down the power level. Remove cdkime, Demonic Attorney from your deck before playing if you're not playing for ante. 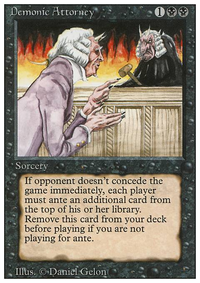 +1: If an opponent does not concede the game immediately, each player must ante the top card of their library. -2: Place a card from the ante zone onto the battlefield under your control. You gain ownership of this card. -8: You get an emblem with "whenever a permanent would leave the battlefield, place it in the ante zone instead." While this might not be 100% in-line with my personality, it seemed too much fun not to create. Besides, I have a special spot in my heart for Demonic Attorney's original rules text. Sometimes cards on this thread have fun ideas, but the implementation is slightly off or they have unintended interactions. Find one of these cards and fix it. 1.) In this casual, multiplayer format, you start with a life total of 30 (rather than the usual 20) and choose a Planeswalker (or legendary creature that transforms into a planeswalker) to serve as your General. You then choose cards to match your Generals color identity to build your deck. A card's color identity is any mana symbol appearing on that card. 2.) The Gatewatch deck contains 65 cards: 1 General and 64 others. 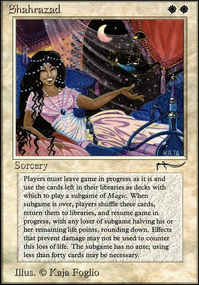 Your deck may contain only one of any individual card, with the exception of basic lands. 3.) The General enters play in the general zone. You may cast your General from the general zone for its normal costs, plus an additional one mana for each previous time it's been cast from the general zone this game. If your General is ever headed to the graveyard or exiled, you may return it to its general zone instead. 4.) 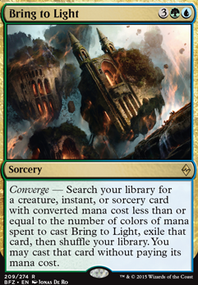 All cards, including your General, must have a Converted Mana Cost (CMC) of 6 or less. In the case of cards with X in their mana cost, X = 0 for the purpose of calculating CMC for construction purposes. 5.) In addition to the normal Magic win conditions, you can win in this format by raising your General's Loyalty to 30 or higher. If recast from the general zone, your General's loyalty always resets to its base value. Theoretically, a deck with 7 copies of Chancellor of the Dross is casual. If EDH wasn't meant to use some of the most efficient cards possible, they would be banned. 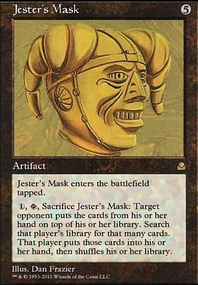 As it is, most of the power nine are on the list, as well as cards like Demonic Attorney. People playing "competetive edh" are having fun, just like it was intended. They just do it in a different way. Doesn't seem so counterintuitive.